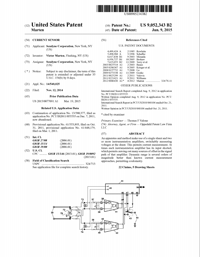 Sendyne was awarded a new patent for an invention that dynamically reduces offset error in shunt-based DC current measurement systems. Offset error is the erroneous value of current read by the measurement system when the actual current is zero. It has a significant impact in battery systems measurements where Coulomb counting information is utilized for State-of-Charge (SOC) determination. The impact of offset error in SOC estimation is more pronounced either during periods of battery inactivity or during repeated charge-discharge cycles such as the ones experienced by hybrid car batteries. Large current offset errors in such systems can result in battery operation significantly outside the SOC limits set by the cell manufacturers. As the offset error changes dynamically with temperature, it cannot be corrected through a single calibration. The Sendyne invention enables dynamic calibration during all stages of battery operation leading to an unprecedented error reduction to less than 14 ppm (parts per million) of full scale. This translates to an error of less than 7 mA in a full scale measurement of 500 A. Reducing the offset error to near zero also enables the use of small-resistance shunts with low output voltages for precisely measuring a wide dynamic range of currents while producing minimal waste heat. The invention falls under the category of Digitally Assisted Analog (DAA) and consists of a specialized circuit coupled with a control algorithm. The circuit’s function is to continuously assess interfering thermoelectric voltage errors and subtract them from the actual measured value. Further, the invention allows the use of proper EMI filters, completely zeroing-out their contribution to offset error. Because current measurement systems are used in noisy environments, such as power systems that convert electrical energy, the ability to use EMI filters can be important. This invention is utilized in Sendyne’s award-winning SFP family of current, voltage and temperature measurement ICs and modules that provide this level of accuracy over a wide temperature range of -40 °C to +125 °C. The full patent, number 9,052,343, is available at the United States Patent and Trademark Office site here.